The Gli Ulivi farmhouse is in one of the most beautiful places in Italy. It is on the coast of Sorrento at a height of 300 m. It sits between lemon trees, olive trees and grapevines and has a splendid view of the sea. The farmhouse is the perfect base to explore the coast. Sorrento is 3 km, Pompeii is 25 km and Capri only 30 minutes away. You can enjoy various invigorating walks in the surrounding hills. Breakfast and dinner can be arranged on request. You will enjoy typical local produce and home made products such as olive oil, wine and organic vegetables. The apartments are simple and practically furnished. The farmhouse is at the end of a narrow little road. It is 300m from the square in Colli di Fintanelle di SantAgnello. Only small cars can reach the farmhouse. You may park the car near the square and walk to the farmhouse. 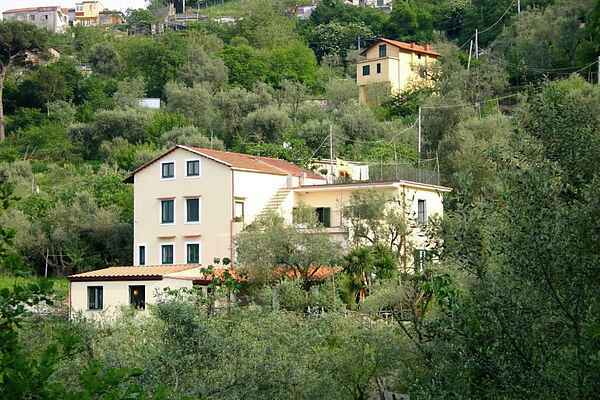 The Agriturismo Gli Ulivi (the Olive Trees) is a farm holiday property located 7 km from Sorrento and 9 km from Positano (Amalfi Coast). Perched at 320 meters altitude in the pristine hills above Sorrento, it affords breathtaking views of the Sorrentine plains and the Gulf of Naples. Just a few meters from the property, you can access the road that takes you to the Amalfi Coast, which is world famous for its splendid views of both the Gulf of Naples and the Gulf of Salerno. Gli Ulivi is 200 meters from the main plaza of the village Colli de Fontanelle and can be reached by walking down a small road. The plaza hosts two restaurants, a mini market, a butcher shop, a bar/cafe and a small pastry shop. From this plaza, you can also take a bus to Positano-Amalfi to see the Amalfi Coast or to the towns of Sant’Agnelo or Pian di Sorrento where train stations are located with service to Naples, Pompei and other points of interest. Gli Ulivi is ideally situated for nature excursions on the Sorrentine Peninsula. There are a variety of hiking paths that offer wonderful panoramic vistas of the Island of Capri, Vesuvius and Naples. The main paths are Sentiero degli Dei, Punta Campanella, Baia di Ieranto nel Parco Marino di Punta Campanella. Gli Ulivi is also a perfect departure point for touring the region’s many important archeological, cultural and panoramic sites (Sorrento 7 km, Positano 11 km, Amalfi 23 km, Ravello 32 km, Pompei 25 km, Ercolano 30 km, Capri 30-minute boat ride, Napoli 40 km, Paestum 90 km). Gli Ulivi’s property covers 2 hectares of land on which the owners cultivate certified organic olives, wine, oranges, lemons, haselnuts and various vegetables. In summer, you can eat outside in the garden and taste some of these homegrown delicacies, such as Sorrento tomatoes as well as wine and olive oil. Breakfast includes traditional homemade marmelade and pastries. The property has a quaint nature path that takes you along olive and citrus groves and leads to a limestone spur. The local authorities have preserved this area with its natural characteristics as a typical example of the native Mediterranean thicket. Here you will find peace and tranquillity as you spend time enjoying the beauty of the local nature and landscape.